Soup is both nourishing and a source of much needed warmth during this time a year. I’ve gathered my best advice for making soups that not only taste delicious but also look the part. 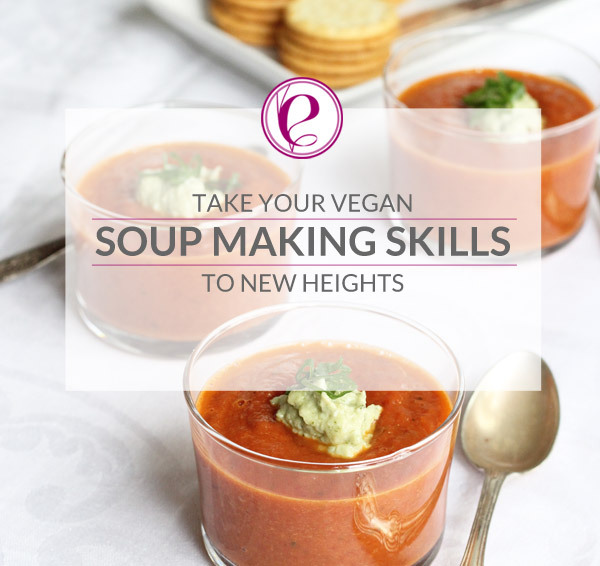 Take your soup making skills to new heights with my advice for enhancing both taste and presentation. Use fresh produce – to accomplish a real yummy soup, ditch the frozen aisle and head over to the fresh vegetable section and select the most beautiful vegetables for your meal. For a more intense flavour – oven roast your vegetables first. Simply slice up your veggies and lightly brush with olive oil, sprinkle with salt and slow roast in the oven before using them in your soups. Skip the nasties – use premium vegetable stock free from MSG and other chemicals. Use fresh lemon juice – it ties all the different flavours together beautifully. Use sparingly since lemon can overpower the taste of your soup completely. A tablespoon should be enough for a large pot. For silky smooth soups – use a hand-blender or a blender to achieve the right airy texture. Garnish with fresh herbs or herb oils – this adds not only to the taste but also the presentation of your dish. Quickly add finely chopped fresh herbs, and blend with a flavourful vegetable oil and drizzle on top. Add some hard liquor – wine, port, beer, vodka and rum can be used to enhance and bring out flavours. Choose alcohol deepening on what type of what flavour your are after. For example red wine or port adds a heavier flavour. Vodka really brings out the kick in chilies. Beer is a perfect companion for heartier and heavier soups. Freshly baked bread is the perfect soup companion – that completes your meal. It doesn’t have to be anything too complicated. While making your bread add herbs and spices to your dough that compliments the flavours of the soup you are making. This is a simple way to enhance your meal. For a list of my vegan soup recipes available on the blog click here. This is an article I’ve previously written for the Happy Cow Veggie Blog. Do you have an collaboration idea? I’d love to hear from you, get in touch here.